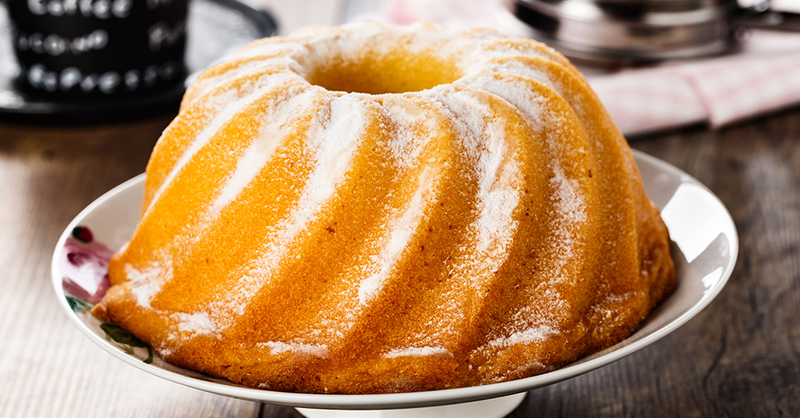 We’ve tried plenty of good lemon bundt cake recipes, but our taste buds were truly awestruck when we came across this mouthwatering version. Greek yogurt keeps this cake perfectly moist, and it has just the right balance of sweet and tart flavors. Its lemony aroma is simply irresistible. We had to sample a bite as soon as it cooled, and it’s so good that the sugar glaze isn’t even necessary. Bring this amazing lemon bundt cake to the next community potluck or make it for a casual weekend breakfast with your loved ones. You can’t go wrong with this recipe — it’s an instant success. Grease a 10-inch (12-cup) bundt pan, and dust with flour. Preheat oven to 325 degrees. Combine flour, baking powder and salt in medium bowl, and set aside. Mix yogurt, 4 tablespoons of lemon juice and lemon zest in a separate bowl. Set aside. Beat sugar and butter at medium speed in an electric mixer until light and fluffy. Mix in eggs one at a time, combining well before adding the next one. Pour in about 1/3 of the dry ingredients, mix on low speed until well blended, and add half of the yogurt and lemon mixture. Blend in another 1/3 of the dry ingredients, the remaining yogurt mixture and the final 1/3 of the dry ingredients. Combine well, but do not overmix. Pour batter into prepared bundt pan, and bake for about one hour until a wooden toothpick comes out clean when inserted in the center. Allow cake to cool in pan for about 15 minutes. Remove from pan, and cool on a wire rack for about one hour. Serve this moist, sweet cake as-is, sprinkle it with granulated sugar, or whisk together powdered sugar and lemon juice for a glazed topping.